What’s the difference between user stories and use cases? Before I dive into an answer to that question, let’s rewind a little bit and talk about where user stories came from. I like them because they’re a great example of how the Agile movement changed the software world. Programmers used to just dive right into software projects and start coding. Whenever one of those pesky users started to tell us what they needed, we’d stop them and say something like, “Don’t worry, I totally get it. I know what you need.” The Agile folks figured out that “I know what you need” is a nasty little trap that programmers — especially good ones — fall into. We’d spend the whole project thinking that we understood our users’ needs, only to deliver software that they didn’t want. The Agile folks realized that if developers had to start working with users throughout the project to understand their needs if they wanted to avoid the code-and-fix trap. Jenny and I teach you all about use cases and requirements in our first book, Applied Software Project Management (O'Reilly, 2005). And that’s why I think the user story is one of the most useful tools to come out of the Agile movement. A user story — some people call it a scenario — expresses one very specific need that a user has. It’s usually written out as a couple of sentences. Most user stories are written in the language of the users, so any user should be able to read a user story and immediately understand what it means. A lot of time, user stories are written on index cards, although I’ve put them in Word documents, Excel spreadsheets and Wiki pages (depending on how the particular project is run). A use case is similar to a user story, because it also describes one specific interaction between the user and the software. When I’m training people to improve the way they write down their project’s requirements, I often describe the use case as a “deceptively simple tool” that helps us find and write down all of the ways users interact with the software. Looking at those definitions, I can definitely see why there’s confusion about the difference between user stories and use cases. If you look at the last two paragraphs, it might sound like I said the same thing twice! But while user stories and use cases are definitely similar, there are important differences between them. Each serves a distinct purpose, and I think they both have their place on a well-run software project. I think the easiest way to understand the difference between use cases and user stories is to take a look at an example. Luckily, I’ve got one that I think helps make the difference clearer. 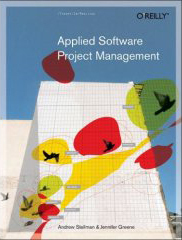 In our first book, Applied Software Project Management, Jenny and I spend a lot of time talking about how to develop use cases and use them to build better software. And as an example, we showed a use case for a software feature that everyone should be familiar with: a search and replace feature from a word processor. 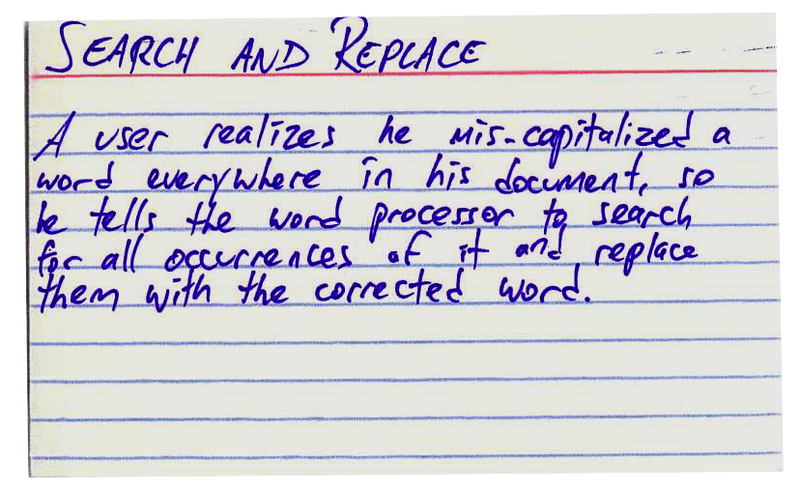 Comparing a user story for search and replace with a use case for the same feature helps highlight the differences. Summary All occurrences of a search term are replaced with replacement text. Rationale While editing a document, many users find that there is text somewhere in the file being edited that needs to be replaced, but searching for it manually by looking through the entire document is time-consuming and ineffective. The search-and-replace function allows the user to find it automatically and replace it with specified text. Sometimes this term is repeated in many places and needs to be replaced. At other times, only the first occurrence should be replaced. The user may also wish to simply find the location of that text without replacing it. Preconditions A document is loaded and being edited. The user indicates that the software is to perform a search-and-replace in the document. The software responds by requesting the search term and the replacement text. The user inputs the search term and replacement text and indicates that all occurrences are to be replaced. The software replaces all occurrences of the search term with the replacement text. In Step 3, the user indicates that only the first occurrence is to be replaced. In this case, the software finds the first occurrence of the search term in the document being edited and replaces it with the replacement text. The postcondition state is identical, except only the first occurrence is replaced, and the replacement text is highlighted. In Step 3, the user indicates that the software is only to search and not replace, and does not specify replacement text. In this case, the software highlights the first occurrence of the search term and the use case ends. The user may decide to abort the search-and-replace operation at any time during Steps 1, 2, or 3. In this case, the software returns to the precondition state. Postconditions All occurrences of the search term have been replaced with the replacement text. Here’s something about use cases that I think is interesting. While you were reading through our use case example, were you thinking of something that looks like the Replace dialog in Notepad or Microsoft Word, or the Find dialog in TextEdit? If so, take another look at the sample use case. It doesn’t have any words like “window,” “button,” “click,” “field” or “checkbox”. It’s all about what actions the user takes, and how the software responds. And there are many different ways that you could build software that implements the use case. Have you ever used the search and replace feature in vi? What about the search and replace feature in Emacs? They have very different user interfaces! Who knew there were so many ways you could implement search and replace? But if you compare each of them with this use case, they all follow the same basic course of events. User stories are about needs. When you write a user story, what you’re describing is a “raw” user need. It’s something that the user needs to do in his day-to-day job. If you never build any software for him, then that need will still exist! Use cases are about the behavior you’ll build into the software to meet those needs. A developer who needs to build working software should be able to read a use case and get a good sense of what the software needs to do. It typically has a lot of detail, and describes everything that the developer needs to build in order to meet the user’s need. That’s why it needs to have a lot more detail, and be clear and unambiguous. Use cases describe a complete interaction between the software and users (and possibly other systems). 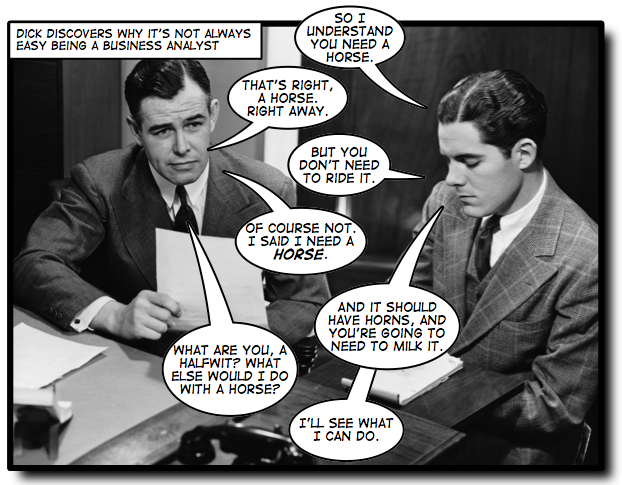 When you’re doing use case analysis, what you’re doing is designing a functional solution that meets the users’ needs. It needs to be something that developers can implement. It’s possible that one user story could spawn several use cases. And when you combine all of your use cases into one use case document, you’ll end up with a complete description of every interaction between the user and the software that you’re planning on building. And if your software has to interact with multiple systems, you may end up treating those other systems as actors in your use case. Once you get a sense of how user stories and use cases differ, you can start to see what purpose they can serve on your project. And if you only use user stories, or if you only use cases, then maybe on your next project you can try using them both. Pingback: Building Better Software › How well does your program do… well, whatever it does? Pingback: Protect What You Pitch | Shawn Yeager + Co.
Pingback: Takeaways: Jason Schwartz’s ‘How Product is Built’ class at GA « Ent!